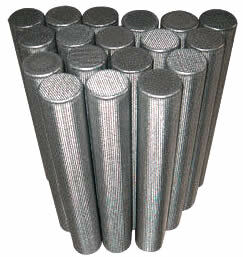 Sintered mesh filter cartridges are made from multi-layers sintered wire mesh, usually 5-layer stainless steel wire mesh. Our sintered filter cartridges has more strong structure, fine permeability and accurate filter precision, easy back wash cleaning. Beside above mentioned benefits, sintered mesh cartridges are resistance to corrosion, high temperature, and high pressure. Its materials are all stainless steel construction, such as AISI304, AISI304L, AISI316, AISI316L. Filter rating range from 1 micron to 250 micron. Sintered mesh filter cartridges are widely used in pharmaceuticals, fluidized beds, liquid and gas filtration, chemical processing, chemical fiber filtration, food and beverage, oil and gas filtration, polyester and water treatment industries.